A self-leveling single-ply lap edge sealant and water cut-off mastic. 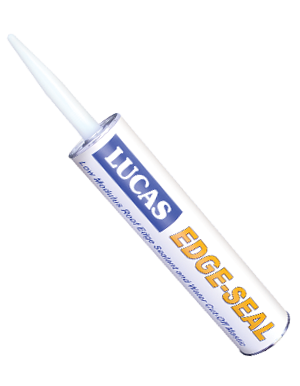 Polymer based Lucas 8600 Edge Seal is a low modulus, butyl rubber based, self-leveling sealant. It is intended for use as a lap edge sealant and water cut off mastic on single-ply roofs including EPDM and TPO. This is also useful anywhere a low modulus sealant is desired such as in OEM trailer and RV applications. Based on butyl rubber in a fast drying, HAP free solvent system.